“Oh, it’s just me today,” I say while setting up my gear. I rarely tell them I most always work alone. It would take far too long to explain how years of babysitting rookie reporters drove me to go solo. They wouldn’t understand, anyway. And though I never do, I’m sometimes yearn to tell them about a young lady who pushed me over the professional edge - a diva in-the-making who oozed arrogance, incompetence and success. We'll call her Jasmine. From the moment Jasmine arrived at my station, she pioneered new ways to piss people off. Though not technically a rookie, she'd spent a year or two as resident morning anchor bunny out west before making a sizable jump to my shop - where she was erringly heralded by management as 'the next Katie Couric'. To her credit she wasn't half-bad on the set. With her stylish hair-do and reasonably good looks, she could melt the Windex off a teleprompter at fifty paces. Trouble was, she was hired to report - and after only a day or two it became glaringly obvious to our journeyman group of veteran photographers that this chick couldn't write a grocery list without a six person support staff. This of course made her exceedingly unpopular with the lens-toting set. Every morning we'd slink in to see what unfortunate sap got 'the bullet'. Grown men would tremble in their photog vests as they watched the assignment editor chalk up their name beside hers. I know, I was one of them. It wasn't just her lack of experience that made working with her such a traumatic experience. Jasmine seemed to regard anyone off-camera as a lower life-form and wouldn't listen to even the most well-intended advice. Never burdened with tact or charm, she had a preternatural ability to say the wrong thing at the wrong time. Once we were in the home of a b-list NASCAR driver, doing morning live shots with a bunch of racing wives as they hawked an upcoming tour of homes. Jasmine simply didn't 'get' NASCAR and went on and on to the assembled trophy wives how stock car racing was 'a bunch of hillbillies riding in circles'. Silence fell over the kitchen we were huddled in and I fought the urge to low-crawl out of the room as the clueless news queen endlessly disparaged the industry that paid for all those palatial homes. The NASCAR wives threw silent daggers with their eyes but my vapid partner-for-the-day never got the hint. I even agreed with much of what she said, but as she prattled on about 'the idiocy of all motor-sports', all I could do was stare at my tripod and fight the urge to bludgeon her to death with it. She was quite simply, the most unlikable person I have ever met. That's saying a lot, considering the business I’m in. For awhile her fate seemed delightfully shaky as she butchered a series of high-profile live shots. Not used to working outside the cushy confines of the studio, the little anchor princess repeatedly short-circuited on camera, prompting low-key high-fives from the control room to the photog's lounge. If this world-class vixen was going to crash and burn LIVE every night, her co-workers were more than eager to make popcorn and roll tape. Sadly, I was the poor schlub saddled to her star the day she halfway redeemed herself. It was an impossibly muggy summer afternoon when she and I rushed to the scene of a fatal house fire. Deep in the barrio of an outlying county, a run-down house had burnt to the ground, killing three small children of an extended migrant family, and whipping the surrounding community into a frenzy. It was bedlam when we rolled up. Grim-faced paramedics and firefighters milled about as a growing crowd of shocked neighbors whispered and wailed outside the smoking rubble of the gutted home. To make matters infinitely worse, the crowd of shrieking family members and looky-loo's spoke only Spanish. "No problem", Jasmine declared, "so do I". But I had my doubts as she grabbed my wireless microphone and delved into the crowd of grief-stricken Hispanics. My suspicions were right when, after using the three Spanish words she knew, she stared blankly at the rush of foreign words her questions sparked. As she spun around helplessly with microphone in hand, I did my best to hide behind a light pole. "We got the 911 tape! We got the 911 tape! ", she bellowed through her perfect grin. Glancing at the aggrieved family (who understood enough English to know this vile women was doing back-flips over the bodies of their dead children), I herded her back into the truck and considered throttling her with an orange drop-cord. Instead I sat with her as she stared at her empty reporter's pad. Despite the fact I wanted to see her fail spectacularly, I listened to myself give her an idea of where to start the story. After about a half hour we were ready to track audio, most of the words coming out of her mouth my very own. When it came time to go live she got through the three line intro and close with barely a hitch, much to my chagrin (and relief). On the way back to the station, she basked in the after-glow of her first successful live shot in weeks, as I tried not to bite a hole in my lip. She was obviously aware of her precarious position with the bosses and now oozed self-absorbed relief. "Ya know, I really think it was fate", she said as she checked her look in the mirror, "it was God's way of rewarding me for working so hard. I just needed the chance to show them what I can do..."
I stared at the stretch of two-lane blacktop in front of us and tried to process what I was hearing. "Let me get this straight", I asked, "God killed three Mexican kids so YOU could have a good live shot?" The rest of the trip was in silence. ‘Jasmine' held on to her gig a little while longer before being unceremoniously dismissed and replaced. I'm not sure where she landed but I'm certain she hoodwinked some other news executive and is no doubt out-earning me as I write this. Which, in the world of TV news, makes perfect sense. Things turned pretty weird the other night when I prowled the packed floor of Greensboro Coliseum as more than eight thousand screaming Fantasia fans watched their hometown home-girl win the title of American Idol. My ears are still bleeding. From the beginning, it was bedlam. A fellow photog hunkered down with a wide angle in the lobby just as the doors flew open, capturing the sudden tidal surge of shrieking teenagers, sign-wielding madmen and whacked-out housewives. With bags, strollers and scary grins, the mob made a mad dash past the camera and into the Coliseum. Once inside they scrambled over seats, hurdled guardrails, and sidestepped slower moving Grannies, all for a chance to wait ninety minutes before...watching television. Fresh off the ratings bonanza that was last year's local sensation Clay Aiken, my station was in prime position to exploit this year's karaoke-fest. 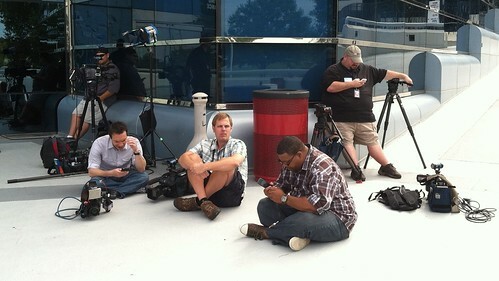 Thus, our crew was in Atlanta last year for the first round of American Idol auditions. Among the many North Carolinian hopefuls they met was a girl who lived just a couple of miles from the TV station. There was something enchanting about the ghetto home-girl with the unique voice and the prizefighter's confidence, the one named for that trippy Mickey Mouse acid flick. The crew rolled tape, Fantasia struck up a tune and the star-making process began. Nine months later, the single mother who could channel Aretha Franklin was still in it, and my station had hyped every nanosecond of her unlikely ascent. The luckiest of my colleagues scored a couple of trips to Hollywood, but I spent most of my time interviewing her old teachers, fellow church members and on one really slow news day, her mailman. Now, it was all culminating with a live viewing party and her friends, fans and newly claimed cousins had turned out en masse to witness her coronation. It may have been billed as the American Idol Finale' but at the Greensboro Coliseum, it was the 'Fantasia Bowl'. "EEEEEEEEEEEEAAAAAAAAAAARGGGGGGGGGGGHHH! FANTASIA WE LOVE YOU! WOOHOOOOOOOOOOOOOOOOOOOO!" The young man looked like he was going to burst a forehead vein. If he did, he’d probably fall on top of me, as he was bent at the waist over a railing, lunging down at my camera and carrying on as if we were old drinking buddies. As I moved away from his section, a clutch of delusional stay-at-home Moms thrust their heavily adorned signs toward my lens and cackled like half-mad hens. A few feet down, a couple of gold-tooth fellows in matching jogging suits issued furious shout-outs. I recorded bits and pieces here and there, careful not to stay anywhere for too long. My job for the evening was to roam and gather videotape for later usage - not to incite coronaries and test bleacher strength. I found a corner, put down my camera and took cover. From my perch, I could see most of the eight thousand strong. The American Idol crew swung their jib camera on its massive arm over the screeching denizens, and I thought a few of the more athletic fans were going to grab hold of it and go for a ride. Thankfully, no one did, but the possibility of popular delusion felt close at hand. As I wiped my brow, I marveled at the level of excitement coursing through the great space. In all my time of capturing emotion on videotape, I’d never witnessed such unbridled adulation as now unfolded before me. College football bowl games, rock concerts, protests of all sizes and descriptions, I’ve pointed a lens at many an emotional stranger. But nothing compared with the manufactured Beatle mania of American Idol. Say what you will about the show, (I damn sure did) but you cannot deny the phenomenon that this cheesy, over-hyped show tune factory has unleashed on humankind. Not after eight thousand unhinged maniacs shake the rafters enough to make you look around for an escape route. Still, I was on the clock - and as any good worker bee, I was ready for a break. As the throng continued to lose their collective dignity, I struck out for the pressroom. Leaving the deafening din of the Coliseum floor, I ducked into a corridor and came out the other side. I found no food in the pressroom, but I did run across another scavenger - a fellow camera-jockey taking his own shelter from the storm. “Where’s the grub”, I asked. Minutes later, Joe and I hovered outside the banquet table set up across the hall from Clay’s dressing room. A caterer was busy packing up, her rollaway cart filled with heaping plates of salmon, chicken, and twice-baked potatoes. She protested a bit at first, but we gave her no choice. Soon we were waddling back down the hallway; beta cams hung low off our shoulders, full hands juggling two bulging plates each. So much for dignity, I hadn’t eaten in eight hours. Besides this was battle, and an army travels on its stomach. After scarfing down the illicit victuals, I bid Joe adieu and walked outside to the sat truck. Inside, my fellow broadcasters were shoveling free pizza down their throats and taking best in whether the crowd would riot if Fantasia lost. I threw in my opinion (no bloodshed, but certain vandalism), dropped off my tapes and made my way back to the Temple of Idol. It was nine-thirty - twenty-five minutes before Ryan SeaSick would announce the winner, and thirty minutes before we were due to go live from three separate locations around the coliseum. As bizarre as the night had already been, I knew the worst was yet to come. I wasn’t disappointed. Back inside the coliseum, the mob was quickly losing their marbles. As I made my way back on the floor I noticed the show was in a commercial break, and all eyes were looking upward, away from the stage. I followed the audience’s collective gaze and spotted the reason for all the calamity. A young couple was dancing way up in the cheap seats, bumping and grinding to “Brick house” pouring from the in-house speaker system. But what may have started out as a social ritual was quickly devolving into a series of backroom gropes and questionable gestures. Mothers around me shielded their offspring’s eyes, especially when the male half broke away from his female partner and started initiating carnal relations with the long handrail running down the stairway. That kind of thing usually requires a cover charge. But the dirty dancers receded into the background as the American Idol logo filled the giant TV screens. As Ryan SeaBass pulled Diana and Fantasia close, the gathered masses once again broke out into cheers for Fantasia and boos for Diana. Pushing in for a closer look, I zoomed in on a kindly old Grandmother hissing and clawing at the sixteen-year-old pageant singer’s image. I was entranced at that particular visual when one of my station’s promotions flack yelled in my ear. Not sure what position she was referring to, I made my way to the front of the stage. It took forever to get through the crowd, and I found my camera and logo didn’t have the sea-splitting power it had just an hour ago. For the gathered populace knew the hour of truth was at hand. Like androids responding to an unseen electronic signal, they hysterical collection of die-hard fans, looked up, quieted down, and began fidgeting in slow motion. As the words drew out, I, stared through my viewfinder, loosened my limbs and prepared for impact. I wasn’t sure exactly what was about to happen but I knew for sure it would not be understated. With that, the previously frozen crowd erupted into a physical display of spiritual release not found in nine out of ten pulpits. The resulting din brought physical pain to the ears; it was the audio equivalent of blinding white light. Fortunately, I could still see, though the one-inch screen jammed to my right eye provided the necessary disconnect. As the crowd grew more frenzied, I grew more deliberate, panning a slow wide shot from the floor to the rafters. Through the lens, I saw grown men praising Jesus, Mothers clutching their babies as if they’d just plucked them from a hole and one Dad bringing shame to his pre-teen daughters with a few break-dance moves he should have left in the car. After a good forty-five seconds, the cheering continued and the crowd showed no signs of letting up. Therefore, I popped off my wide angle lends and went hunting for the faces I knew were there. It didn’t take long to find them. A quick pan to my left and I centered up on a close-up of a woman’s face lost in rapture. As I slowly zoomed in, a fat tear rolled down her cheek as she mouthed the word “Fan-ta-sia”. Yahtzee! Looking around the room, I recorded more tight shots of relieved and ecstatic believers. You would have thought Fantasia had been the first ghetto diva to walk on the moon judging from the crowd’s reaction. I didn’t have the hear to tell them their hero had won the right to sign one of the most lopsided contracts in recording history. I valued my hide far too much for that. For a solid five minutes, the elated throng cheered for their newly -crowned soul music queen, giving me plenty of time to capture the ensuing madness. As I did, it occurred to me how diverse the assembled fans were. Nascar Dads High-fived over-groomed metrosexuals, project-housing grannies bear-hugged white kids in polo shirts, heavily made-up trophy wives bumped hips with men who’d spent the previous evening on a park bench. American Idol may indeed be 95 percent hype, but it’s a hype that binds. I must have looked pretty psychotic myself, for the ecstatic throng actually retreated a couple of steps, despite the fact they could have crushed my exhausted form many times over. Just as they did, the director back at the station punched up our shot and the reporter kicked into autopilot. All went well until the crowd spotted themselves on the monitor at the reporter’s feet. As they once again proceeded to testify at the top of their lungs, I looked over at an engineer buddy, smoking a cigar and standing rock-steady in the sea of jubilation. Something about his sense of peace gave me strength, and I began to realize that the long night and the incredible saga of a hometown girl’s meteoric rise to the top would soon, blissfully, be over. I just shudder to think what would have happened that night had she lost.